This is what happens when you work like a fiend on Father’s Day. This is what happens when you slam a post-hole digger (I’m not sure I’ve got the hyphen in its proper place, or whether it requires a hyphen, or what) into the ground and it, for some reason, comes ricocheting backatcha and bonks you on the noggin. Jim’s a brave guy, though, I must admit. After he did this, he just kept working, until the blood, which he didn’t know was spilling forth at great rates from the shallow but productive wound, began to run into his eyes. Then he stopped, applied some baby wipes, stemmed the worst of it, and finished the job. Did I mention he was out in the middle of nowhere. By himself? At least he facebooked it so people would know where to find the body. He came home and asked for a little assistance in cleaning the thing. Which, I was willing to provide. Until I got so queasy I needed some help. Peter, too, got a little queasy, but we got through it (it was a long hour). 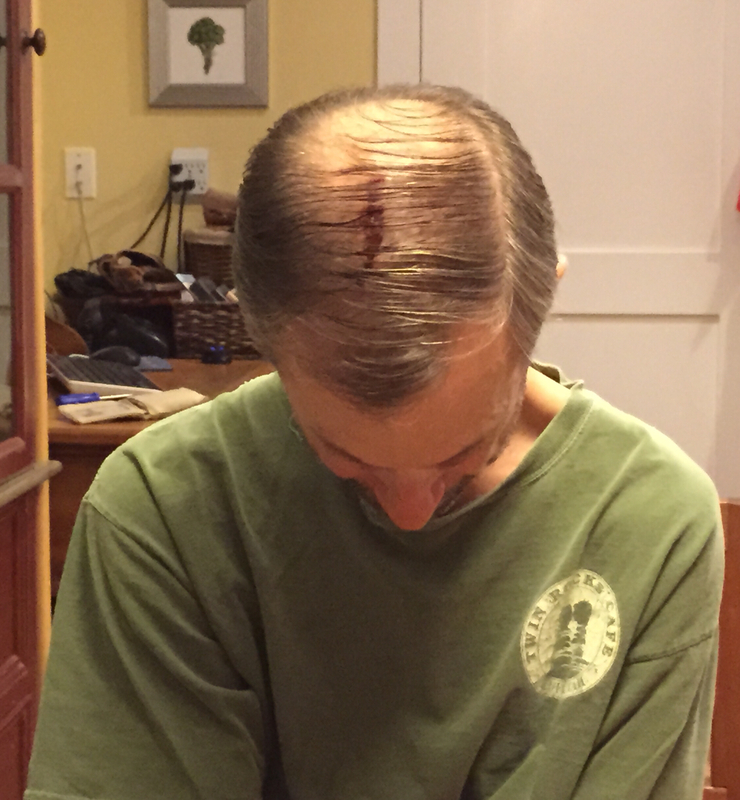 Anyway… head wounds bleed a lot, but there is nowhere for the wound to go before you hit the skull, so it wasn’t terribly deep, if heavily vascularized. He’s fine. The pillow survived. He can comb his hairs. It’s all good. It kind of took my breath away. It’s way better now.